Associate Neurology Residency Director, Danielle Becker, is currently volunteering in Tanzania at the Foundation for African Medicine & Education (FAME) for the third time in the last 4 years. During her last trip, she and University of Pennsylvania general neurologist, Michael Rubenstein, successfully obtained funding to bring additional anti-epileptic medications for generalized epilepsy syndrome. For this trip, her goal was to create a satellite Penn epilepsy division. FAME now has an EEG machine donated by the University of Pennsylvania Neurology department. Danielle was accompanied on this trip by Lindsay Ferraro (Penn Neurology Residency class of 2015 and current epilepsy fellow) and Cara Linebroker (a Penn EEG technician, ). 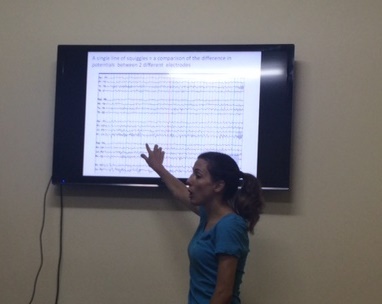 They have been training the medical staff at FAME to perform and interpret EEGs. This has already made an impact. Today, Danielle saw a 19 year old girl with epilepsy. She had received treatment for focal seizures, but the EEG showed generalized epileptiform discharges, consistent with a generalized seizure disorder. Having EEG available allowed Dr. Becker to switch the patient to an appropriate anti-epileptic medication.